John F. Herring was born in central London in 1795. His father had a fringe-making and upholstery shop in Newgate. From an early age, it appears that Herring had a dislike for the city and in 1814 he boarded a stagecoach and headed for Doncaster (in the north of England). He arrived in Doncaster on the day of the famous St. Leger Cup and quickly found work painting and driving stagecoaches. It was during one of his trips, from Doncaster to Halifax, that he met the distinguished landowner Mr. Charles Spencer-Stanhope; soon after Spencer-Stanhope commissioned Herring to paint a portrait of his chestnut Hunter. In 1818, at the age of 23, he was offered his first major private commission from the philanthropist Mr. Hawksworth. This same year he his first work at the Royal Academy in London titled Portrait of a Dog. It was also during this period that he obtained the commission to paint all the winners of the St. Leger Cup and in 1827 he received a similar commission for the winners of the Derby. These portraits, painted with great detail and precision, were then engraved and distributed to an eager public … adding to Herring's fame and popularity. He remained in Doncaster for a number of years and met many wealthy and influential patrons. He also married during this time and had six children, a number of which would become great artists in their own right – John F. Herring, Jr. and Benjamin Herring, Jr.
By 1833 he moved with his family to London and began painting his now very popular farmyard scenes and continued painting portrait of the winners of many important races. In 1836 Herring began exhibiting at the Royal Society of British Artist (becoming a member in 1841). He was invited to Paris by the French Heir to the throne in 1840 to paint his five horses; this set of paintings were engraved and published in both France and England. His fame did not go unnoticed in England and in 1845 he was appointed Animal Painter to Her Royal Highness The Duchess of Kent. 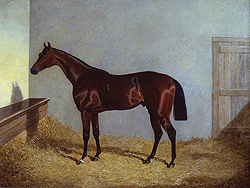 One of his paintings were gifted to Queen Victoria; upon receiving it she was so impressed, that she commanded Herring to paint a picture of one of her horses as a present for Prince Albert. 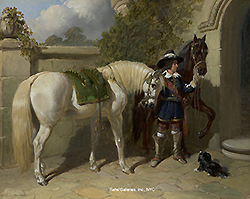 During the 20 years Herring lived in London, he established himself as one of the great masters of horse painting and exhibited alongside Sir E. Landseer and Benjamin Marshall. Finding himself so well established, Herring decide to move from the crowded city to a farm in Kent in 1853. In this relaxed atmosphere, he continued to paint and live until his death in 1865. Today, examples of his work can be found in most major collections of British Sporting art including Tate Gallery, London; Nottingham Art Gallery; Victoria & Albert Museum, London and the Baltimore Museum of Art, Maryland.